For other people named Jágr, see Jágr (surname). Jaromír Jágr (Czech pronunciation: [ˈjaromiːr ˈjaːɡr̩] ( listen); born 15 February 1972) is a Czech professional ice hockey right winger who is currently playing for HC Kladno in the 1st Czech Republic Hockey League. He has played in the NHL with the Pittsburgh Penguins, Washington Capitals, New York Rangers, Philadelphia Flyers, Dallas Stars, Boston Bruins, New Jersey Devils, Florida Panthers, and the Calgary Flames, serving as captain of the Penguins and the Rangers. After leaving the Rangers in 2008, he played three seasons in the Kontinental Hockey League (KHL) with Avangard Omsk. However, he returned to the NHL in 2011 with the Flyers, and remained in the league for seven more years before being assigned by the Flames in 2018 to HC Kladno, which he owns. Jágr has the second-most points in NHL history. He is the most productive European player who has ever played in the NHL and is considered one of the greatest professional hockey players of all time. In 1990, at age 18, he was the youngest player in the NHL. Until his transfer, at age 45, he was the oldest player in the NHL, and is the oldest player to record a hat trick. In 2017 Jágr was named one of the 100 Greatest NHL Players in history. Jágr was the fifth overall selection in the 1990 NHL Entry Draft. He won consecutive Stanley Cups in the 1991 and 1992 seasons with the Penguins. Individually, he has won the Art Ross Trophy as the NHL scoring champion five times (four times in a row), the Lester B. Pearson Award for the NHL's outstanding player as voted by the NHL Players' Association (NHLPA) three times and the Hart Memorial Trophy as the League's most valuable player once, while finishing second four times. Jágr began skating at the age of three, and he immediately showed exceptional abilities. At the age of 15, he was playing at the highest level of competition in Czechoslovakia for HC Kladno, and when he was 17, he became the youngest member of the Czechoslovak national team. Jágr was the first Czechoslovak player to be drafted by the NHL without first having to defect to the West; his selection in the NHL draft came as the Iron Curtain was falling. Because of this, after Jágr was taken by the Pittsburgh Penguins with the fifth overall pick in the 1990 NHL Entry Draft, he was able to come immediately to North America from Czechoslovakia. When he attended the draft, in Vancouver, he was the first Czechoslovak player present at the NHL draft with his government's blessings. He was a supporting player with the powerhouse Penguins that won back-to-back Stanley Cups in 1991 and 1992. He was one of the youngest players in NHL history, at 20 years of age, to score a goal in the Stanley Cup Finals. Before he had a clear grasp of the English language, Jágr could be heard reading the daily weather forecast on Pittsburgh radio station WDVE in his broken, thickly accented English. He and teammate (and fellow countryman) Jiří Hrdina were promoted as the "Czechmates," a play on the term "checkmate" from chess. He would also play Scrabble in an attempt to increase his English vocabulary. Some Penguins fans realized that the letters in his first name could be scrambled to form the anagram "Mario Jr.," a reference to teammate Mario Lemieux. In the 1994–95 season, Jágr won his first Art Ross Trophy as the scoring champion of the NHL. He tied Eric Lindros with 70 points but won based on his 32 goals to Lindros' 29. The next year, Jágr set a record for most points, 149, by a European-born player. Both his 62 goals and 87 assists from that season still stand as career-highs. His 1995–96 totals for assists and points stand as the records for right-wingers in those categories. After the 1997–98 season, captain Ron Francis signed with the Carolina Hurricanes, leaving Jágr the Penguins' captaincy. From 1997–98 to 2000–01, Jágr would win four-straight NHL scoring titles. In 1999, he would win the Hart Memorial Trophy as the NHL's Most Valuable Player, as well as the Lester B. Pearson Award. In 1998, he led the Czech Republic to a gold medal at the Nagano Olympics. On 30 December 1999, Jágr scored three goals and four assists for a career high seven-point night against the New York Islanders. He would later match this feat on 11 January 2003, by once again scoring three goals and four assists in a game against the Florida Panthers as a member of the Washington Capitals. In 2000–01, Jágr was struggling to find his scoring touch and faced criticisms about his relationship with coach Ivan Hlinka[dead link]. With the return of Mario Lemieux from retirement, the Penguins had two superstars, but friction developed between the two; Jágr held the captaincy but many fans regarded Lemieux as the talisman of the team. Additionally, the struggling, medium-market Penguins could, with Lemieux back, no longer hope to afford Jágr's massive salary. Thus, on 11 July 2001, the organization traded him, along with František Kučera, to Washington in exchange for Kris Beech, Michal Sivek and Ross Lupaschuk. In 806 games with Pittsburgh, Jágr became only the second player, after Lemieux, to score 1,000 points in a Penguins sweater. Jágr sits second behind Lemieux in career goals in franchise history and third in games played, assists and points, having been passed by Sidney Crosby. Later that same year, the Capitals signed Jágr to the then-largest contract ever in NHL history at $77 million over seven years, an average annual value of $11 million, with an option for an eighth year. Jágr, however, did not live up to expectations in Washington, as the Capitals failed to defend their division title and missed the playoffs in 2002. For the first time during his tenure with the Capitals, Jágr failed to finish among the NHL's top scorers, make the post-season or make the NHL All-Star Team. During the summer of 2002, the Capitals reunited Jágr with former linemate Robert Lang. In 2002–03, Washington managed to finish sixth overall in the Eastern Conference, but lost to the upstart Tampa Bay Lightning in the first round of the 2003 playoffs despite winning the series' first two games. The lack of organizational success prompted the Capitals to unload much of their high-priced talent in order to save money—not just a cost-cutting spree, but also an acknowledgement that their attempt to build a contender with high-priced veteran talent had failed. Disgruntled, Washington ownership spent much of 2003 trying to trade Jágr, but a year before a new Collective Bargaining Agreement (CBA) was to be signed, few teams were willing to risk $11 million on Jágr. On 23 January 2004, Jágr was eventually traded to the New York Rangers in exchange for Anson Carter and an agreement that Washington would pay approximately $4 million per year of Jágr's salary. Jágr also agreed to defer (with interest) $1 million per year for the remainder of his contract to allow the trade to go through. Jágr with the Rangers in the 2008 playoffs. Due to the new CBA signed before the start of the 2005–06 season, Jágr's salary was subsequently reduced to $7.8 million, the maximum allowed under the terms of the new salary cap. During the NHL labor dispute in 2004–05, he had played for HC Kladno in the Czech Republic, and afterward for Avangard Omsk in the Russian Superleague (RSL). Jágr led the Czech Republic to gold at the 2005 World Hockey Championships in Austria and was elected a tournament all-star in the process. He also became a member of hockey's prestigious Triple Gold Club, players who have won a Stanley Cup, a World Hockey Championship and an Olympic gold medal. Prior to the 2005–06 season, the Rangers had missed the playoffs for seven consecutive seasons. Following the fire sale of the high-priced, underachieving veterans that made up the team's roster, as well as the retirement of long-time captain Mark Messier, many experts picked the Rangers to be the worst team in the NHL. Jágr disagreed and promised the team would surprise a lot of people and make the Stanley Cup playoffs. He started strong during the beginning of the 2005 season and the return from the lockout of the NHL. He became only the fourth player in NHL history to score ten or more goals in less than ten games at the start of a season. His return to dominance helped the Rangers return to the Stanley Cup playoffs, but injuries to Jágr and others contributed to a four-game sweep in the first round by the New Jersey Devils. Jágr scored his 1,400th point on a power play goal against the Philadelphia Flyers on 2 March 2006, pushing him past Jari Kurri into second place all-time among European-born players. He later passed Stan Mikita to become the all-time leader. On 18 March 2006, against the Toronto Maple Leafs, Jágr became only the sixth Rangers player in team history to break the 100-point barrier, and became the only Ranger right winger to score 100 points in a season. On 27 March 2006, against the Buffalo Sabres, Jágr had a goal and an assist, which tied both the Rangers' single-season goal record of 52 (Adam Graves, 1993–94) and the Rangers' single season points record of 109 (Jean Ratelle, 1971–72). Two nights later, on 29 March, Jágr passed Ratelle when he assisted on Petr Průcha's first-period goal against the New York Islanders' Rick DiPietro. On 8 April, against the Boston Bruins, Jágr scored his NHL-leading 53rd goal of the season, breaking the Rangers' single-season goals record. After leading the League in points and goals for most of 2005–06, Jágr was surpassed by the San Jose Sharks' duo of Joe Thornton (125 points) and Jonathan Cheechoo (56 goals), losing both the Art Ross and Maurice Richard trophies in the final week of the season. Jágr finished with 123 points, 54 goals and 24 power-play goals, second in the League in all three categories. He also finished third in the NHL in both assists (69) and plus-minus (+34). However, just as in Washington, playoff success was not to be for Jágr, whose Rangers were swept in four games by New Jersey. In the series, he suffered a dislocated shoulder in the third period of the first game of the series, which kept him from playing at his top form for the rest of the series. Jágr had surgery on the shoulder after the Rangers were eliminated from the playoffs. Despite being inched out by Thornton for the Art Ross Trophy and Hart Trophy (league MVP), Jágr won his third Lester B. Pearson Award as the NHL's most outstanding player. During his acceptance speech for the Award, Jágr said, "With this award, you get voted on by players you play against every night and I think they understand the game better than the media." He has been named to seven NHL First All-Star Teams. On 5 October 2006, before the first game of the 2006–07 NHL season against his former team Washington, Jágr was named as the 24th captain in the history of the New York Rangers, replacing Mark Messier, who had retired before the 2005–06 season. Jágr then proceeded to score a goal on his very first shift in the game, just under 30 seconds into the new season. On 19 November 2006, Jágr scored his 600th career NHL goal on Tampa Bay goaltender Johan Holmqvist, making him the 16th player in NHL history to do so. Power play linemate Brendan Shanahan had scored his 600th goal almost three weeks earlier, making them the first teammates in NHL history to score their 600th goal in the same season. On 10 February 2007, against Washington, Jágr earned an assist on a goal by Michal Rozsíval to record his 1,500th career point. He is only the 12th NHLer to reach this mark, and the fourth fastest player to do so after Marcel Dionne, Mario Lemieux, and Wayne Gretzky. On 5 April 2007, against the Montreal Canadiens, Jágr scored his 30th goal of the 2006–07 season to record 15 consecutive seasons of 30 or more goals, tying the NHL record held by Mike Gartner. After a regular season slowed by a weak shoulder, Jágr then led the New York Rangers to a sweep of the Atlanta Thrashers in the Eastern Conference Quarterfinals, the Rangers would fall to the Buffalo Sabres in Game 6 of the Conference Semifinals. On 14 November 2007, against New Jersey, Jágr scored his fourth goal of the 2007–08 season at the Prudential Center in Newark, making him the first player to score a goal in 53 different NHL arenas. On 3 July 2008, Jágr, an unrestricted free agent for the first time in his career, was informed by Rangers General Manager Glen Sather that the club would not re-sign him. Sather admitted that the two sides never engaged in detailed negotiations for a new contract, and that after many months of speculation, Jágr was "seriously considering" going to Russia to finish his career, despite offers from other NHL teams. Jágr expressed a desire to possibly finish out his career at his father's club, HC Kladno. On 4 July, Jágr agreed to a two-year contract with Avangard Omsk of the Kontinental Hockey League (KHL); the deal was reported to pay Jágr the equivalent of US$5 million annually. Jágr was named Avangard's captain on 30 January 2009. As a member of Avangard, Jágr was sitting next to Alexei Cherepanov, a first-round pick of the New York Rangers, who died during a game against Vityaz Chekhov. They were discussing the past shift when the 19-year-old Cherepanov collapsed onto Jágr on the bench at the Ice Hockey Center 2004 in Chekov. In April 2009, Jágr publicly stated an interest in returning to the NHL, stating that he really just needed a break from the pressures of an 82-game NHL schedule. Jágr, who claimed to have lost 15 pounds since his last NHL season, and who was "practicing a lot harder than [he] ever did in [his] life", stated he would be interested in joining the Edmonton Oilers because of the interest they showed in July 2008. Following the expiration of his original contract with Avangard, however, Jágr re-signed with Avangard for the 2010–11 season. On 1 July 2011, Jágr returned to the NHL, but rather than signing with his original NHL team in Pittsburgh, he opted to sign a one-year, $3.3 million contract with the Philadelphia Flyers, the Penguins' cross-state rival. He scored his 1,600th NHL point during his debut game with the Flyers, assisting on a Claude Giroux goal as the Flyers won their season opener 2–1 over Boston on 6 October 2011. Typically playing on the first line with Giroux and Scott Hartnell, Jágr was among the top scorers during the start of the 2011–12 season. He scored his first and second goals as a Flyer on 24 October against the Toronto Maple Leafs. On 29 October 2011, he scored his 650th and 651st NHL goals against the Carolina Hurricanes. He scored his only goal of the 2012 playoffs during Philadelphia's series against Pittsburgh. The Flyers were eliminated by the New Jersey Devils, who would ultimately become the 2012 Eastern Conference champions. On 3 July 2012, Jágr signed a one-year deal, reportedly worth $4.5 million, with the Dallas Stars. The signing marked Jágr's first time playing for a club in the Western Conference. Jágr said during a conference call two days later that the Montreal Canadiens had been his first choice as a free agent. "I always wanted to play in Canada and I wanted to go to Montreal if I had a chance, but Montreal wasn't interested," Jágr said. "All of a sudden I got a phone call from Stars' general manager Joe Nieuwendyk that Dallas was interested." During the NHL lockout in 2012–13, Jágr played for his own team, Rytíři Kladno, in the Czech Extraliga. During the lockout, he scored 24 goals and 33 assists in 34 games and, before leaving Kladno for the Stars, was in second place of Czech Extraliga's scoring list. After the NHL lockout ended, he made his debut as a Star on 19 January 2013, when he tallied two goals and two assists in a 4–3 victory over the Phoenix Coyotes. Jágr hit the 1,000-assist mark on 29 March 2013, against the Minnesota Wild, becoming just the 12th player to do so and the first non-Canadian NHLer to reach the milestone. On 2 April 2013, Jágr was traded to the Boston Bruins in exchange for two prospects and a draft pick. He made his Bruins debut on 4 April, scoring the lone goal in Boston's 1–0 win over the New Jersey Devils, and with his second Bruins goal, the first scored in a 3–0 shutout over the Florida Panthers on 21 April 2013, Jágr tied the record for the most game-winning goals in an NHL career (118), previously set by past Bruin great Phil Esposito. When Jágr played in the first game of the 2013 Stanley Cup Finals, he set a new record for the longest gap between Finals appearances at 21 years, surpassing the previous record of 19 years, which was established by Gary Roberts in 2008; coincidentally, both instances involved someone with the Penguins at one end of those streaks. Also coincidental was that, as in his previous Stanley Cup appearance, Jágr's opponents were the Chicago Blackhawks. After the Bruins lost the Finals to Chicago, the team announced on 26 June 2013, that they had no intention of re-signing Jágr. On 22 July 2013, Jágr agreed to a one-year deal with the New Jersey Devils. The deal included $2 million guaranteed and another $2 million incentive if Jágr were to play at least 40 games. Jágr, at age 41, hoped to help the Devils overcome the loss of Ilya Kovalchuk, who had previously departed for the KHL. Jágr scored his first goal as a Devil on 7 October 2013, in a 5–4 shootout loss to the Edmonton Oilers. The goal came on the 23rd anniversary of his first NHL goal which, coincidentally, was against the Devils. On 21 November 2013, Jágr tied Gordie Howe's record of game-winning goals with 121, with his 690th goal, which tied him in ninth place (with former teammate Mario Lemieux) for all-time goal-scoring leaders. On 20 December, he scored his 693rd goal, putting him in eighth place over Steve Yzerman. A day later, Jágr tied Mark Messier for seventh place in NHL history for goals scored with 694. Later in the season, on 14 January 2014, he scored his 695th goal, passing Messier, putting him 14 goals away from passing Mike Gartner. On 1 March, Jágr scored his 700th career NHL goal as the Devils won 6–1 against the New York Islanders at Nassau Veterans Memorial Coliseum. On 8 April, near the conclusion of the Devils' season, he was awarded the New Jersey Devils MVP Award at their annual team awards ceremony. He scored two points in his final game of the season (two assists in the third period), surpassing Gordie Howe for eighth place on the NHL's all-time list for career assists and tying Steve Yzerman for sixth on the all-time points list at 1,755. Jágr finished the season as the team's leading scorer, with his highest points total in a season since 2007–08. Jágr's play led the Devils to re-sign him to another one-year contract on 30 April. He became the joint sixth-highest scorer in NHL history in November 2014 after scoring his 708th NHL goal for the Devils against Boston. On 8 December, in his 1,500th NHL game, he moved ahead of Marcel Dionne for fifth place on the NHL's all-time points list with 1,772. On 3 January 2015, in a game against the Philadelphia Flyers, Jágr became the oldest player in NHL history to score a hat trick at 42 years and 322 days. The record was previously held by Detroit Red Wings defenceman Nicklas Lidström. On 26 February 2015, the Devils traded Jágr to the Florida Panthers in exchange for a second-round pick in the 2015 NHL Entry Draft and a third-round pick in 2016. He made his team debut on 28 February in a 5–3 Panthers win over the Buffalo Sabres and registered his first points with the team in the following game on 1 March, posting a goal and an assist in a 4–3 win over the Tampa Bay Lightning. On 19 March, Jágr scored his 718th career goal against Detroit to move him past Phil Esposito and fifth on the all-time goal scoring list. In a 9 April, 4–2 Panthers victory over the Bruins, Jágr registered two assists to give him 1,800 career points in the NHL and sole possession of fourth place on the all-time points list, surpassing former Penguins teammate Ron Francis. On 11 April, in the Panthers' season finale, Jágr reached 2,000 NHL points (including playoff games) when he assisted on a Jonathan Huberdeau goal. He then scored his 800th NHL goal (including playoffs) later in the third period. On 12 April, one day after the end of the 2014–15 regular season, Jágr signed a one-year, $3.5 million contract extension with Florida. Jágr reached multiple milestones as a Panther. On 20 December 2015, Jágr moved into fourth all-time on the NHL scoring list, scoring his 732nd goal to move past Marcel Dionne for fourth place in NHL history. On 4 February 2016, Jágr became the 6th player in NHL history to record 1100 career assists. Then, on 20 February, Jágr scored his 742nd goal, surpassing Brett Hull for third place in NHL history. In a 7 March, 5–4 overtime loss to the Bruins, an assist on Aleksander Barkov, Jr.'s goal put Jágr at 1,851 career points, passing Gordie Howe on the all-time points list and putting him in sole possession of third place overall. With the Panthers qualifying for the 2016 Stanley Cup playoffs, Jágr played in his first playoff series since the 2013 Stanley Cup Final. Though he only registered two assists in the Panthers' six-game first round exit to the Islanders (who would win their first playoff series since 1993), he became the fifth NHL player all-time to record 200 career playoff points. At the age of 44, Jágr led the Panthers in scoring with 66 points. In reward for his strong play and leadership abilities, the team announced the re-signing of Jágr to a one-year, $4 million contract on 5 May 2016. On 20 October 2016, Jágr became the third player in NHL history to score 750 goals. On 22 December 2016, he scored his 1,888th career point, surpassing Mark Messier to become second in career points, and on 15 February 2017, his 45th birthday, he became the second player to register his 1,900th NHL point. In 2017 on Twitter, as a free agent, he tweeted: "FA 1994 - all GMs called, FA 2017- 0 calls" accompanied by a trophy emoji and a smiley emoji, as well as pictures taken in 1994 and 2017. In the 1994 picture, a smiling Jágr is on the phone with an unspecified general manager. In the 2017 picture, he is seen looking at his mobile phone with a puzzled expression on his face. The Panthers organization announced shortly after that they would not be seeking to re-sign Jágr. On 4 October 2017, Jágr signed a one-year deal with the Calgary Flames. Jágr had indicated before that he would like to play professionally until he is 50 years old, but later stated it is very likely he will stop playing after this season, at which point he will only be 46. He noted the tendency of teams to focus on younger players to the exclusion of older ones like himself, which he considers understandable and in light of which he remarked, "I was pretty lucky." The Flames represent Jágr's ninth NHL team, but his first Canadian team; he said, "I want to get the experience so I can one day say I played for a Canadian team. So I’m here." On 9 November 2017, Jágr scored his first goal as a Flame, and first ever for a Canadian team, getting 2 points against the Detroit Red Wings in a 6–3 win. However, on 6 January 2018, it was reported that Jágr and the Flames were working towards a contract termination, as injuries had limited Jágr to a career-low 7 points, including only the aforementioned goal, in 22 games. On 14 January 2018, Jágr was placed on the injured reserve, retroactive to 31 December 2017, while the Flames called up Ryan Lomberg from their AHL affiliate, the Stockton Heat, in his place. On 28 January 2018, it was reported that Jágr was placed on waivers, signalling the end of his brief tenure with the Calgary Flames; he cleared waivers the following day and was assigned to HC Kladno in the WSM Liga. Although he has repeatedly denied that he has a gambling problem, he admitted in 2003 that he settled debts totaling $950,000 with two internet gambling sites between 1998 and 2002. The first of these incidents centered on Belize-based website CaribSports and its owner, William Caesar, to which Jágr owed $500,000. Sports Illustrated reported that Jágr agreed to make monthly payments to Caesar to settle the debt, and Caesar leaked the story to the press when Jágr stopped making payments. In 2003, the Internal Revenue Service (IRS) filed a $3.27 million lien against him for unpaid taxes for the 2001 tax year. Only a few months before, Jágr had settled a $350,000 claim for taxes dating to 1999. In the summer of 2006, Jágr sued his former accountant over a tax form that was supposed to have been filed in 2003, claiming that the form would have saved him $6 million had it been filed in a timely fashion. Jágr resides in the Czech Republic during the off-season. His father, also named Jaromír Jágr, owns a chain of hotels and serves as president of HC Kladno. Jágr wears the number 68, which he has worn through his entire career, in honour of the Prague Spring that occurred in Czechoslovakia in 1968 and his grandfather, who died while in prison that same year, and had earlier been imprisoned for opposing the collectivization of his farm in the postwar Communist takeover of Czechoslovakia. In any interviews when asked about his number Jágr explains that he wears it not due to bad relations with Russian people, but rather due to disaffection with Communism. During his time with the New Jersey Devils, Jágr was granted special exception to keep wearing number 68, as then-general manager Lou Lamoriello had a policy in place which generally forbade players from wearing any number higher than 35. Jágr has been a long-time supporter of the liberal conservative Civic Democratic Party (ODS), stating in 2004 that he "had always" voted for the party. In the previous election, he appeared on the party's billboards and was among its sponsors. On 26 May 2010, Jágr announced he was backing the Civic Democrats and its leader Petr Nečas. At the press conference, he said, "I realize that there will be elections in two to three days. I would like their outcome to be good." He also urged the party not to forget about sports when distributing money. "We all know what would happen if the young did not practice any sport. If children practice some sport, they do not have time for other things such as alcohol." Jágr is an Orthodox Christian; he was baptized in 2001 by Prague's metropolitan. He began to speak more publicly about his faith during his three-year stint in Russia (a historically Orthodox nation). Jágr's longevity in the NHL has spawned a fan club known as "The Traveling Jagrs", a group of hockey fans from the Alberta cities of Calgary and Camrose who share interest in the player. The group dresses in the sweater, hockey socks and pant shells of eleven of Jágr's teams (his nine NHL teams, the NHL All-Star Team, and the Czech national team) plus long black wigs in reference to Jágr's traditional look. Usually the club would travel once or twice a year to see him play in person, but with Jágr signing with the Flames they announced they would be a more regular fixture at games. Jágr has represented his country many times. In 1994, he and Martin Straka arrived in the middle of the 1994 World Championships after Pittsburgh's elimination from the Stanley Cup playoffs. Czech fans' expectations were high as Jágr was an NHL star, but before the team was able to integrate him into the team, the Czechs lost their quarterfinal game and were eliminated from tournament. Jágr was also hurt in numerous other games. The 1996 World Cup of Hockey also did not see Jágr at his best. His performance was hampered by the flu and it only underscored the poor play of the whole team — after losing 7–3 to Finland, 3–0 to Sweden and even 7–1 to a relatively weak Germany, the team did not qualify for the tournament's playoffs. 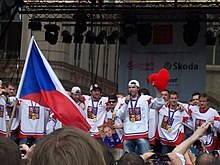 The team's recent failures, however, were mitigated in 1998 when the Czech Republic won the men's gold medal in the 1998 Winter Olympics in Nagano, Japan. It was only the third gold medal for Czech or Czechoslovak sportsmen from the Winter Olympics and it is still fondly remembered. Jágr did not play in the 1996, 1999, 2000 nor 2001 World Championships in which the Czech Republic won the gold medals. He was, however, a member of the team at the 2004 World Championship in Prague, where the expectations were high. After the team won all the games in the group, however, they lost in the quarterfinals game, stumbling out of the tournament. It was the 2005 edition of the tournament that finally brought a gold medal to Jágr. Although he broke his finger in an early game against Germany, he played with it bandaged during the rest of the tournament and led his team to victory. More injuries struck Jágr in the 2006 Winter Olympics in Turin. He was injured after a hit from Finland's Jarkko Ruutu, requiring stitches to his eyebrow. The injury, however, was not as serious as first anticipated, and Jágr was able to play in the following games, though he was unable to finish the bronze medal game due to muscle injury. Despite the trouble, Jágr won his second-career Olympic medal, the bronze. In 2010, Jágr was his nation's flag bearer at the 2010 Winter Olympics, but in the men's ice hockey tournament, the Czechs finished a disappointing seventh after a defeat in the quarterfinals to Finland. Jágr again represented his country at the 2014 Winter Olympics in Sochi, scoring two goals and one assist in five games as the Czech Republic again lost in the quarterfinals. After losing to Sweden in a battle for a bronze medal on 2014 IIHF World Championship in Minsk, Belarus, Jágr announced the end of his career in international play with the Czech national team, focusing his efforts on returning to the NHL post-season after New Jersey failed to qualify in 2014. Jágr, however, stepped back from his decision after being called up to the Czech team for the 2015 IIHF World Championship in Prague and Ostrava, making the team's roster. On 1 May, he scored a goal in the Czechs' 6–5 loss to Sweden, his 50th for the national team, to become the oldest player to score at the World Championship. In the Czech Republic's quarterfinal game against Finland, Jágr scored one assist and two goals, including the game-winning goal. At the end of the tournament, despite the Czechs' loss in the bronze medal game, Jágr was named the tournament's Most Valuable Player. These records are as of 27 February 2017 for regular season games unless stated otherwise. Jágr is currently second in NHL career regular season points and is fifth in career playoff points. He is also currently amongst the career leaders in several other major NHL regular season statistical categories: goals (3rd), assists (5th), games played (2nd), overtime goals (1st), game-winning goals (1st), even strength goals (2nd), power play goals (T-11th), points per game (20th) and shots on goal (2nd). Also amongst all-time leaders in NHL playoff statistical categories, Jágr ranks in the top 20 in points (5th), goals (11th), assists (9th), overtime goals (T-3rd), game-winning goals (8th), games played (T-15th), power play goals (T-15th) and shots on goal (3rd). Jágr with the Bruins awarded the Prince of Wales Trophy following their Eastern Conference Finals series sweep over the Pittsburgh Penguins in 2013. ^ "NHL Statistics, All-Time Career Points". NHL.com. Retrieved 24 May 2015. ^ Rosen, Dan (4 January 2015). "Jagr becomes oldest to net hat trick, Devils rout Flyers". NHL. Retrieved 22 June 2015. ^ "100 Greatest NHL Players". NHL.com. 27 January 2017. Retrieved 27 January 2017. ^ "Triple Gold Club". Iihf.com. Retrieved 14 November 2012. ^ a b c Swift, E.M. (12 October 1992). "The KID From Kladno: By achieving NHL stardom, the Penguins' Jaromir Jagr has realized the dream he had as a youth in Czechoslovakia". Sports Illustrated. Retrieved 23 December 2016. ^ "Athlete profile: Jaromir Jagr". CNN. 3 February 1998. Archived from the original on 8 May 2008. Retrieved 25 August 2007. ^ "Super disappointment". CNN. 2000. Retrieved 26 September 2006. ^ Kasan, Sam (12 February 2018). "Crosby continues writing his legacy with recent milestones". NHL. ^ "Capitals get Carter in return". espn.com. 26 January 2004. Retrieved 25 August 2007. ^ "Jagr's 53rd goal a Rangers record". Chicago Tribune. 9 April 2006. Retrieved 15 November 2014. ^ "Rangers' Jagr has shoulder surgery". ESPN.com News Services. 2006. Retrieved 26 September 2006. ^ "Never close to a deal, Rangers say goodbye to Jagr". Newsday. 2008. Archived from the original on 6 July 2008. Retrieved 3 July 2008. ^ Zinser, Lynn (5 July 2008). "Jagr's New York Exit Becomes N.H.L. Farewell". New York Times. Retrieved 5 July 2008. ^ "Jagr signs two-year deal with Avangard Omsk". TSN.ca. 2008. Archived from the original on 13 April 2014. Retrieved 4 July 2008. ^ "Jagr Says Oilers Would be His First Choice for Return to NHL". TSN. 2009. Retrieved 2 May 2009. ^ "Jagr stays with Avangard Omsk". ESPN (via Associated Press). 6 May 2010. Retrieved 6 May 2010. ^ "Jaromir Jagr returns to the NHL, signs one-year deal with new-look Flyers". Associated Press. 1 July 2011. Archived from the original on 8 January 2013. Retrieved 8 January 2013. ^ "Toronto Maple Leafs at Philadelphia Flyers Game Recap – 10/24/2011". Nhl.com. Retrieved 14 November 2012. ^ "Carolina Hurricanes at Philadelphia Flyers Game Recap – 10/29/2011". Nhl.com. 29 October 2011. Retrieved 14 November 2012. ^ "Habs were Jagr's first choice". Slam.canoe.ca. 6 July 2012. Retrieved 19 November 2013. ^ "The Dallas Morning News | Options". Dallasnews.com. Retrieved 19 November 2013. ^ "Jagr reaches assists milestone; Stars end Wild's win streak". Tsn.ca. 30 March 2013. Archived from the original on 3 June 2013. Retrieved 19 November 2013. ^ "Stars trade Jagr to Bruins for two prospects, draft pick". Tsn.ca. 4 February 2013. Archived from the original on 5 April 2013. Retrieved 19 November 2013. ^ Kalman, Matt (4 April 2013). "New Jersey Devils at Boston Bruins : 04/04/2013". National Hockey League. Retrieved 4 December 2015. ^ Switaj, Caryn (21 April 2013). "Moving in the Right Direction – Jagr Nears Milestone with GWG". BostonBruins.com. Retrieved 21 April 2013. ^ "Jagr finally returns to the Finals". ESPN – Elias Says. Retrieved 13 June 2013. ^ Gretz, Adam. "Jaromir Jagr won't be back with Bruins". CBSSports.com. Retrieved 19 November 2013. ^ Mazzeo, Mike (23 July 2013). "Report: Jaromir Jagr signs $2 million deal". ESPN. New Yor. ^ "NHL Capsules – NHL.com – News". NHL.com. Retrieved 19 November 2013. ^ Eric Duhatschek (22 November 2013). "Ageless Jagr reaches two more career milestones". The Globe and Mail. Retrieved 20 December 2013. ^ "Regular Season – All Skaters – Career Leaders – All Teams – Career Points – NHL.com – Stats". NHL.com. Retrieved 20 December 2013. ^ "Jagr ties Messier for seventh place on NHL goals list". NHL.com. 21 December 2013. Retrieved 21 December 2013. ^ Rod Perry. "Jaromir Jagr scores 695th career goal, passes Messier". Retrieved 1 October 2014. ^ Allan Kreda. "Jaromir Jagr Gets 700th Goal, and Devils Rout the Islanders". Retrieved 1 October 2014. ^ Mike Morreale (13 April 2014). "Devils' Jagr passes Howe on all-time assists list". NHL.com. Retrieved 13 April 2014. ^ "Jagr announces retirement from international play". NHL.com. Retrieved 1 October 2014. ^ Willoughby, Ian (11 November 2014). "Jágr now joint sixth highest scorer in NHL". Radio Prague. Retrieved 15 November 2014. ^ "Jagr passes Dionne on all-time points list in 1,500th game". NHL.com. 8 December 2014. Retrieved 8 December 2014. ^ "Philadelphia Flyers – New Jersey Devils – January 3rd, 2015". NHL.com. ^ "Jaromir Jagr traded to Florida Panthers by New Jersey Devils". NHL.com. Retrieved 27 February 2015. ^ "Jagr helps Panthers edge Lightning". NHL.com. Retrieved 1 March 2015. ^ "Jaromir Jagr scores 718th goal, passes Esposito for fifth all-time". cbssports.com. Retrieved 19 March 2015. ^ Gorten, Steve. "Bruins lose to Panthers, out of playoff position". NHL.com. Retrieved 10 April 2015. ^ "Jaromir Jagr 2014-15 Scoring Log - Hockey-Reference.com". ^ "Jagr signs one-year contract with Panthers". NHL.com. Retrieved 12 April 2015. ^ "Jaromir Jagr moves into fourth all-time on NHL scoring list – Toronto Star". ^ "Jagr gets No. 742, passes Hull for third". NHL.com. Retrieved 20 February 2016. ^ Poupart, Alain. "Jagr passes Howe on points list". NHL.com. Retrieved 8 March 2016. ^ "Jagr Becomes 5th Player with 200 Career Playoff Points". Bleacher Report. 22 April 2016. Retrieved 25 April 2016. ^ "Panthers re-sign Jagr to one-year deal". TSN. 5 May 2016. Retrieved 5 May 2016. ^ "Jaromir Jagr scores 750th NHL goal". NHL.com. 20 October 2016. Retrieved 21 October 2016. ^ Menning, Rick (23 December 2016). "Jaromir Jagr breaks tie for No. 2, Panthers fall to Bruins". Associated Press. Retrieved 16 February 2017. ^ "Jaromir Jagr gets 1,900th NHL point". NHL.com. 15 February 2017. Retrieved 16 February 2017. ^ Jagr, Jaromir (29 June 2017). "FA 1994- all GMs called, FA 2017- 0 callspic.twitter.com/7uLJm95CAB". @68Jagr. Retrieved 2 July 2017. ^ "Flames Sign Jagr". NHL.com. 4 October 2017. Retrieved 5 October 2017. ^ "Jaromír Jágr wants to play until 50". ESPN.com. 5 April 2017. Retrieved 5 May 2017. 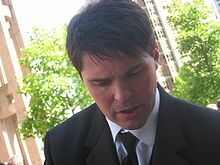 ^ a b c "Jaromir Jagr says '99.9 per cent' this will be his last season". Sportsnet.ca. 4 October 2017. Retrieved 4 October 2017. ^ Johnston, Mike (6 January 2018). "Calgary Flames, Jaromir Jagr working on an exit". sportsnet.ca. Retrieved 6 January 2018. ^ "Jagr placed on injured reserve by Flames". NHL.com. 14 January 2018. Retrieved 20 January 2018. ^ "Calgary Flames to waive Jaromir Jagr - Sportsnet.ca". Sportsnet.ca. Retrieved 28 January 2018. ^ "Flames Assign Jaromir Jagr to HC Kladno". NHL.com. 29 January 2018. Retrieved 30 January 2018. ^ "Návrat krále: Rytíři Jaromíru Jágrovi vyřizují transfer kartu z Calgary". www.hc-kladno.cz (in Czech). 29 January 2018. Retrieved 30 January 2018. ^ Johnston, Mike (3 February 2018). "Jaromir Jagr lights up scoresheet in first game with Kladno". sportsnet.ca. Retrieved 3 February 2018. ^ "Jágr vybral nové trenéry pro Rytíře! Sám bude za Kladno hrát". sport.cz (in Czech). 14 May 2018. Retrieved 23 May 2018. ^ "Jaromir Jagr casually scores four goals in game to promote club to top Czech league". sports.yahoo.com. Retrieved 21 April 2019. ^ Everson, Mark (8 February 2006). "JAGR HAS BATTLED WAGERING WOES IN PAST". New York Post. Retrieved 30 May 2018. ^ a b Farber, Michael; Yaeger, Don (2003). "Capital Losses". Sports Illustrated. Archived from the original on 29 May 2006. Retrieved 26 September 2006. ^ David Conti (2006). "Jagr sues former accountant". Pittsburgh Tribune-Review. Archived from the original on 14 November 2007. Retrieved 26 September 2006. ^ "Jágr's father, HC Kladno president". Archived from the original on 3 March 2010. ^ a b Prague Spring – 1968. "Brotherly help" of Kremlin. youtube from Omelchuk TV. ^ Stromberg, Mike (5 August 2015). "After Lou Lamoriello's Exit, It Appears Many of His Quirks Will Leave With Him". Allaboutthejersey.com. Retrieved 9 March 2019. ^ "Jaromír Jágr v závěru volební kampaně podpoří ODS" (in Czech). České noviny. 26 May 2010. Retrieved 30 May 2010. ^ a b "Jaromír Jágr podpořil ODS. Nechci abychom dopadli jako Řecko!" (in Czech). ODS. 26 May 2010. Archived from the original on 30 May 2010. Retrieved 30 May 2010. ^ "Jsem pravoslavný křesťan, přiznal Jágr" (in Czech). 4 June 2010. Retrieved 4 June 2010. ^ Frank Seravalli, Jagr sticks with his faith, Philadelphia Daily News. Published 3 May 2012. Accessed 13 June 2013. ^ Pickens, Pat (5 October 2017). "Traveling Jagrs recruiting new member after hero signs with Flames". NHL. ^ Pickens, Pat (18 March 2017). "Traveling Jagrs cheer on their hero in New York". NHL. ^ "Jaromir Jagr announces retirement from Czech National Team". NBC Sports. Retrieved 3 May 2015. ^ "Jagr returns from retirement to play for Czechs at worlds". Yahoo! Sports. Retrieved 3 May 2015. ^ "Jagr named to Czech Republic roster for 2015 Worlds". NHL.com. Retrieved 3 May 2015. ^ "Czech Republic roster, 2015 IIHF World Ice Hockey Championship". IIHF.com. Retrieved 3 May 2015. ^ "Jaromir Jagr becomes oldest ever to score at world championship". Fox Sports. Retrieved 3 May 2015. ^ "Jagr mania as Czechs advance". IIHF. Retrieved 19 May 2015. ^ "Jagr wins MVP". IIHF. Retrieved 19 May 2015. ^ "Hart Memorial Trophy". NHL.com. Retrieved 14 July 2014. ^ "Art Ross Trophy". NHL.com. Archived from the original on 27 April 2006. Retrieved 14 July 2014. ^ "Ted Lindsay Award". NHL.com. Retrieved 14 July 2014. ^ "Jaromir Jagr wins Masterton Trophy". NHL.com. Retrieved 22 June 2016. ^ "NHL All-Rookie Teams". Hockey-Reference. Retrieved 14 July 2014. ^ a b "Jaromir Jagr". Hockey-Reference. Retrieved 14 July 2014. ^ a b "NHL All-Star Teams". Hockey-Reference. Retrieved 14 July 2014. ^ a b c "Jaromir Jagr" (in Czech). Sportovci.cz. Archived from the original on 5 December 2013. Retrieved 14 July 2014. ^ "All-Star Teams – IIHF World Championship". Hockey Canada. Retrieved 14 July 2014. ^ "IIHF Directorate Awards and Most Valuable Player – IIHF World Championship". Hockey Canada. Retrieved 14 July 2014. ^ "Continental Cup to Omsk". KHL.ru. Retrieved 14 July 2014. Cazeneuve, Brian (24 October 2011). "The Jagr Hockey School". Sports Illustrated. SI.com. Retrieved 3 April 2017. Wikimedia Commons has media related to Jaromír Jágr.